City: Defined for the purpose of this paper as an urbanized area managed and represented by one or several local governments, culturally and communally defined as city, with specific administrative and political boundaries. City region: The general urbanized, ecological and economic catchment area surrounding and comprising one or several urban nuclei, all or any of which may be defined as city. Climate-stable practice: A city's climate-stable practice is a practical commitment to lower greenhouse gas emissions by the year 2050 to an amount that is proportionally in keeping with the globally sustainable level deemed to be 3.3 tons per person per year in 1990 levels..
CO2-e: Carbon-dioxide-equivalent. CO2-e: carbon-dioxide-equivalent. Expresses the presence of all effective greenhouse gases as an amount that would be required in CO2 to achieve the same effect. Fossil cities. The majority of modern cities not only depends on the safe supply of fossil fuels, their very existence, form and growth dynamics are explained by the logic of the fossil fuel economy. Fossil cities will be inoperable in a post-fossil era, unless they manage the transition to a renewable energy economy and supply system. The term ‘solar city’ is used here to polemically emphasize the characteristics of cities in terms of energy base and emissions behavior in contradistinction to those of fossil cities. Greenhouse gas (GHG): Human activity effected gases that trigger global warming are carbon dioxide (CO2), methane (CH4), nitrous oxide (N2O), chlorofluorocarbons, especially CFC-11, HCFC-22, and CF4. Their emission levels are in this document expressed as C02-e.
Postglobalism, Postglobalization. These expressions are coined here to characterize globalization as a fossil-fuel induced phenomenon, and to denote the post-fossil era as ‘postglobalized’. They describe an era in which globalization will be differentiated into local flows of basic food, regional resources and certain manufactured goods, and a time of a reasserted primary industry sector, especially agriculture. Globally it anticipates a time when primarily services and information flows will be global, but basic levels of economic dependency and sufficiency will be defined locally and regionally. As policy of local self-determination and quality of life improvement, postglobalism is already rising in various communities. This is exemplified by the Slow City initiatives of Orvieto, Italy. Renewable energy: all energy forms that can be replenished without relying on finite sources such as fossil deposits. Solar city: notes for the purpose of this article an urban community embarked on a comprehensive path towards substituting renewable and sustainable forms energy for fossil and nuclear sources, while aiming at absolute greenhouse emissions targets for its populations in keeping with global sustainability goals. See also ‘Climate-stable practice’ and ‘Fossil city’. Solar energy: 'solar' in its wider definition connotes all aspects of energy sources which can be traced to the action of the sun. These include solar thermal, photovoltaic, biomass, bio energy, wind and wave energy (and, strictly speaking, also fossil fuels). In this sense 'solar' describes renewable forms of energy that neither create greenhouse gas emissions nor non-degradable and/or toxic waste. A solar energy economy would exhibit dramatically altered urban development dynamics globally, regionally and locally. Sustainable energy: energy sources that do not pollute the atmosphere, water and soils in irreparable or harmful ways. Two daunting challenges confront the world’s cities and city regions well within this coming generation, affecting the global urban system and human civilization as a whole: fossil fuel depletion and man-made catastrophic climate change. If these are not swiftly and effectively met their impacts will deeply affect all industrial, world and mega-city systems — and hit hard the fast-growing, major urban agglomerations of the developing world, along with their economies. Since the 1970s and 1980s the prospects of fuel depletion have only slowly begun to enter general urban planning and development frameworks, largely as energy efficiency and conservation issues. In terms of climate change communities have only during the 1990s begun to recognize that all greenhouse gas (GHG) emissions are directly or indirectly generated locally, through acts of agency, production or consumption. This has provided a boost to the role of local places in the debate since GHGs can be allocated and made understood locally and hence form the basis for specific policies, programs, plans and projects. A number of organizational and cultural barriers mitigate against swifter, wider change. Among these are the subsidiary regard in which cities are held in the traditional hierarchical frames of international arrangements dealing with globally encountered challenges. Another is posed by the short planning horizons and political uncertainties that prevail on the local level. In terms of policy development, measurement techniques and planning reality an extraordinary, even paradoxical gulf exists between the global nature of greenhouse gas impacts and fuel depletion prospects, and the local reality that represents both final impact and original source of globally experienced changes. Despite the significant hurdles energy issues have begun to take center stage in the reality of an increasing number of cities and towns around the world. The leaders of these pioneering communities realize that because of the central significance of cities in national economies, and their utter dependence on relatively short-term fossil fuel supplies — and the devastating effect of their burning on human health the global climate — the speed and magnitude in which renewable energy strategies are being introduced will be of crucial importance to the future of global civilization and local cultural settings alike. As socially, politically, economically and culturally significant settings cities face increasingly intense local action, in their communities’ search for improvement of the local environment, and in a rising movement to combat global warming well before that time. Business, industry, science, technology and governments are being challenged to respond and deliver solutions. It is here where a growing number of new urban action and development initiatives are being readied to link local agendas and national frameworks to international challenges and resources. The challenges confronting a rapidly urbanizing human civilization are unprecedented. As long as the current path is pursued there is the dilemma of a massive investment in obsolete infrastructures, since any urban area or long-term urban systems element that is intrinsically dependent on fossil fuel will be rendered dysfunctional within only a few decades. All basic urban communication infrastructures, both traditional — such as roads, rail, air and sea ports — and advanced have been nurtured in a world of total fossil fuel dependency. Indeed, the internet, an increasingly vital global and largely urban network of networks, relies largely on fossil-fuel operated hardware, conduit-based webs, and wireless communication carrying media. If global communications are to be sustained beyond the middle of this century, they must be powered by distributed, ubiquitous and redundant renewable power supply systems. The world depends on fossil fuel. Fossil fuel use increased five-fold over this past half century, from 1.7 billion tons of oil equivalent in 1950 to 8 billion tons in 1999, providing 85% of the world’s commercial energy. The majority of this energy is used either within cities, or for transport from and to cities (Girardet). Most contemporary fuel sources are due to expire well within this century as widely available and relatively peacefully contested sources, and much of this reality will become globally pervasive within the next thirty to fifty years (see Figure 1). Even conservative industry, national and international governmental sources estimate that oil will expire by 2050 — the depletion of the more easily accessible supply sources is likely to take place already in the 2020-2030 time frame (Scheer). Given rising use rate scenarios natural gas is likely to evaporate by 2040. The logistically and environmentally most problematic source of global fuel supply, coal, is expected to expire well before 2100 — provided no large scale efforts of energy fuel substitution is pursued to stretch its deposits. Uranium is expected to be depleted by the mid-2030s, even if the daunting cost, security, safety, disposal and public acceptance dilemmas were not to weigh so heavily against its application. Significant growth rates in uranium use are not anticipated, given the risks involved and a waning willingness among many governments to pursue nuclear fission further. Nuclear fusion, more than half a century after its arrival as a great Modern dream, still struggles with enormous conceptual and technical flaws, and the problems associated with huge financial, environmental and political costs. These include the specter of wide-spread public resistance to a new generation of nuclear super-reactors. 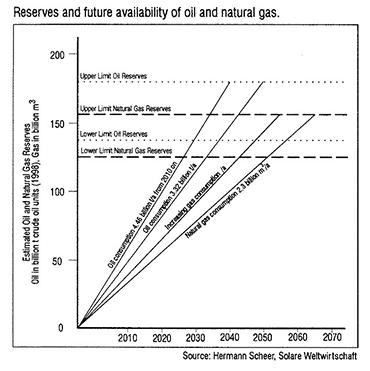 Figure 1: The prospects of fossil fuel depletion under a range of scenarios. This outlook is as troubling as it is under-emphasized in its public significance. Fossil fuel is the very source of modern economies and their petrochemical, transport and industrial production systems — and hence also sustain the spatial centers of global civilization: cities and city regions. The modern city, its history, form and growth dynamics, is entirely inconceivable without it. Yet a persuasive agenda to deal with the prospects equitably, humanely and positively still eludes global and local planners alike. Modern cities have mushroomed on their rich fossil nutrient supply, and especially voracious and dependent are the largest, most rapidly growing urban agglomerations. The very logic of their global rise and regional spread is founded on the availability of powerful, centralized and inexpensive fuels: coal, petroleum and natural gas — yielding fossil urban structures and patterns based on fossil transport, fossil construction machinery and fossil industrial systems and manufacturing processes. Intensive economies and labor markets clustered around the centralized and networked city regions and were anchored by heavy investments in infrastructure: power, transport and communications. This increasingly bolstered cities’ primacy over non-urban hinterlands. The new cities of the 19th and 20th centuries - and the very cultures they engendered - were a product of combustion: London exploded with coal-fired power, pre- and post-World War II modern city innovations in the Soviet Union, the United States, Europe and across Asia alike were literally jump-started by the electrifying jolt of the new energy technologies. Los Angeles, as urban system, carrier of cultural content and global paradigm, is the proverbial petroleum city. It is appropriate to refer to contemporary urban areas as fossil cities. The logic of global urbanization becomes transparent when considering the broad availability of inexpensive power for all urban infrastructures: building construction, lighting, air conditioning, computing and telecommunications and massive freight and human transport systems on surface, sea and air. These new bundles of infrastructure at once link cities globally and drain their regions. As a consequence globalized urban systems are inherently more vulnerable to a serious — and inexorable — decline of global fossil fuel supplies than those that rely more on their local and regional human and land resources. While some local urban systems theoretically are relatively safe of a terminal fossil fuel shock through their reliance on hydro-electric, nuclear or bio-energetic power, no currently utilized alternative energy source alone can help the vast majority of cities world-wide. Also, the interconnectedness of the global system makes it impossible to seriously contemplate the survivability of regional pockets of self-sufficiency. The only viable option to secure the continuity of urban civilization in this century is a system-wide turn to a broad portfolio of renewable energy sources, based on an overwhelming availability of solar, wind, wave and geothermal energy. The alternative to this path lies in a massive military build-up as its is already being prepared by some leading economies. A global and open escalation of the simmering war over regional fossil resources, currently contained largely in local and regional conflicts is inevitable without a broad and world-wide introduction of renewable energy sources. Cities and city dwellers would bear the brunt of such conflicts. Global climate change is perhaps the most long-term and devastating effect of the massive, recent and rapid world-wide burning of much of the global Carbon Age heritage: the organic carbon stores, deposited and sequestered, for example, in coal sediment layers over the past 330 million years (Wahlefeld). The powerful release of stored carbon dioxide and other gases of similar atmospheric impacts destabilizes the planetary climate system through a strengthening of the positive radiation feedback mechanism known as the greenhouse effect. The results of a warming earth surface include rising ocean levels, affected food crops, shifting regional weather patterns and the advance of tropical diseases. There is also the distinctive prospect of catastrophic feedback systems, such as volcanic eruptions in glacial areas, disturbed oceanic methane strata and the thawing of methane-rich tundras. As primary energy consumers cities and other urban systems are the largest single sources of CO2 equivalent greenhouse gas emissions. As hypertrophic urban growth is being fuelled by the fossil-fed economy, the new agglomerations also become the worst offenders in carbon emissions, and the most difficult to retrofit to a renewables-based, zero-emissions behavior. The protocol resulting from the 1997 Kyoto United Nations Framework Convention on Climate Change had most industrialized nations agree to a five percent cut of carbon-dioxide-equivalent emissions by 2010, although it is widely agreed that a 60% cut is required to actually halt global warming. As a global target based in international development equity principles, a figure of 3.3 tons of carbon dioxide-equivalent emissions per person per year (based on the customary 1990 figures) is also being proposed as a total sustainability measure to reflect the actual oceanic and forest sink capacity of the earth (Byrne). The United States today produces nearly 26 tons, while India still lies well below this level, at 1.8 tons (see Figure 2). The large imbalance between nations — the world average lies at seven tons — results in the specter of a sizable and complex global carbon market, heralded by some as an effective mechanism to achieve overall reductions and equity and decried by others as a pollution licensing scheme for the rich. Figure 2: Relative national distribution of per-capita greenhouse gas emissions measured against sustainable levels. Source: Center for Energy and Environmental Policy. The global need to work towards large-scale savings in fossil energy consumption as well as greenhouse gas (GHG) emissions calls for a systematic integration of renewable energy products, systems and processes in cities and regions — where most human emissions originate. However, many industrialized countries see mitigating action still largely as a challenge of energy efficiency and conservation measures and expect most savings to be made in lowering electricity consumption in residential and commercial buildings and in altered transport and land-use patterns. In the long run efficiency and conservation measures have only limited capacity to reduce fossil fuel use and combat global warming given the massive fuel requirements that will continue to grow well into this century, particularly in the developing world. Renewable energy technologies have to be advanced immediately to be available in time for a significant and relevant supplementing and replacement role half a century hence. While cities are increasingly seen as settings for local environmental action and instruments of international and national greenhouse gas abatement, much of the prevailing urban energy agenda is still aimed either at issues of efficiency, or at isolated but highly visible renewable energy technology installations, without a sense of sustained and comprehensive action or an understanding of the relative value of individual agenda items. As cultural, economical and technological system the built environment is deeply affected in its form by the nature of its basic fuel supply. Fossil changes in the general urban structure were highlighted by the leaders of the great Modern design movements, from the beginning of the 20th century: Futurism in Italy, Constructivism in the Soviet Union, De Stijl in the Netherlands, Das Bauhaus in Germany, the declarations resulting from the International Modern Architecture Congresses (CIAM - Les Congrès Internationaux de I'Architecture Moderne, 1928-1956) and the International Style that spread from the United States throughout the industrialized world. These movements and the broader societal changes they express were supported by the dawn of the fossil machine age. This new age, an outgrowth of earlier stages of the Industrial Revolution when hydro-power was a main driver of textile mill operations, was boosted by the discovery of coals’ potential and the discovery of electricity, giving rise to Frederick Winslow Taylor (1856-1915) and Henry Ford’s (1863-1947) ideas about the mechanization of manufacturing and later the increasingly urban and automated global production-consumption systems of the advanced industrial age, boosting global power consumption at an exponential rate. Indeed, industrialization as powered by electricity, coal-fired steam engines and petroleum combustion motors, meant the rapid growth of cities, driving the search for innovation in urban form. As far as western urban traditions are concerned, a rash of utopian premonitions spread as a result, as revolutionary as the technological changes they were triggered by. Peter Kropotkin’s (1842-1921) and other anarcho-syndicalist influences on ideas about ideal communities were a direct outgrowth of this era, as were Sir Ebenezer Howard’s (1850-1928) concepts and the rise of the Garden City movement — and the genesis of the Regional Plan Association of New York and its seminal plan of 1929, Frank Lloyd Wright’s (1869-1959) Broadacre City (first described in his 1932 work The Disappearing City), Ludwig Hilbersheimer’s (1885-1967) mass housing concepts, and General Motors’ extraordinary ‘Futurama’ pavilion at the 1933 ‘Century of Progress’ World Exposition in Chicago, anticipating the glorious, then-futuristic car friendly cities to come. Brasilia, Canberra and all of the British New Towns are fossil fuel fantasies come true. And so are the modern suburbs. Early modern ex-urban subdivisions were developed as aspiring new communities along the tracks of the early electric tramways, while soon thereafter the combustion-engine driven vehicle created a new urban reality altogether: that of the new car suburbs expanding along motorways. The electric mass-media driven promotion of a new fossil-fuel based lifestyle centered around the motor cars and petrochemical products suffused industrial civilization after World War Two, even more so than the heroic visions of humanity’s redemption by machine had promised before the war, in a new set of aspirations in urban form. And these very much were practical visions indeed: already very early in the 20th century the great electric inventions of the telephone and the elevator opened the door to unprecedented skyscraper cities. Modern carbon culture arrived in style with the epitomizing work of migrant Bauhaus architects such as Walter Gropius and Mies van der Rohe, and others. Le Corbusier’s ideas about the radical modernization of cities are widely regarded as being among the most influential of these in urban terms, brazenly calling for the razing of pre-fossil cities, as exemplified by his tabula rasa modernization concepts Plan Voisin, La Ville Radieuse, a famous lone pilot project for a mass housing block, Unite d’Habitation and in some realized projects such as in the Alsatian town of St. Dié. The introduction of this simple and revolutionary technological development doctrine in cities in the United States, United Kingdom and countries around the world, combining the power of the new with a good dose of basic speculative opportunism, brought about urban destruction and blight through wholesale urban renewal projects in what was identified as inner city slum areas: the neighborhoods of the poor and disenfranchised and the pre-fossil relics they inhabited. The post-war years in Europe saw powerful expansion plans hatched among the spreading webs of electrification that crisscrossed former farmlands: the Greater London strategy, the satellite city concepts, the Stockholm and Copenhagen finger plans gave much vaunted plan form to a wider, world-wide turn to life in cities, driven by structural shifts and opportunities brought about by the rise of the fossil fuel economy and its promises. Figure 3: Air pollution levels in cities. Figure 4: Health effects of air pollutants. Calls for more concentrated and transit-oriented forms of urban development (Calthorpe) were signs of this declining stage of the fossil-fuel economy when savings in energy conservation and fuel efficiency were identified as the cheapest, fastest and most immediately useful means to limit emissions. Denser cities were shown to be more fuel-efficient (Newman and Kenworthy; see Figure 5). Car dependence and low-density urban structures that were incapable of sustaining public transport came to be understood as a major hindrance to achieving sustainable urban life. It is clear that in the long run, however, efficiency and conservation measures are not sufficient to halt the powerful world-wide rise in emissions. Massive substitutions of conventional energy technologies will be needed, such as those powering the making, operation, maintenance and upkeep of military machinery, and systems of passenger and freight conveyance with sustainably renewable systems of energy supply and use. In order for these new technologies to be in place in time to be of significant use they need to be widely introduced now. In this sense, transit-oriented development and recent attempts at recreating pre-industrial urban patterns such as ‘neo-traditional design’ and other approaches of ‘new urbanism’ are important interim measures but fossil-fuel derived urban form phenomena themselves. 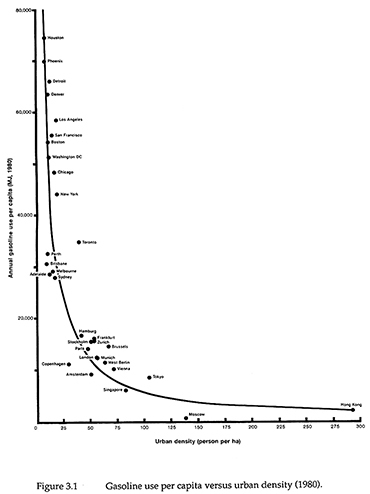 Figure 5: One of Newman and Kenworthy’s seminal charts of the 1980s, correlating the density of international cities with their fuel consumption. The nature and form of buildings, too, were deeply affected by the development and spread of the revolutionary new fuels and the industrialized manufacturing processes they engendered. As a consequence architecture changed radically in the new fossil age, logically breaking with all earlier traditions. The Modern Movement provided aesthetic and ethical refinement to mass applications in electricity, ubiquitous machinery, air conditioning, industrial steel products, advancing glass technology, mass produced curtain walls, prefabricated building systems and a number of other highly energy-intensive technologies. The new thinking about buildings, highlighted by the International Style, applied to aesthetically refined, ornament-free, skeletal, industrialized and largely corporate structures. It became the new global aesthetic of the possible as the advanced fossil age dawned in cities around the world. Buildings became disconnected from their climatic and cultural context due to the end of local resource dependency. An interest in vernacular form and regionalism emerged, as a counter-reaction and an attempt to recapture the local language of form: the regional building traditions that had been lost in industrializing change. This movement remained a stylistic artifice since it failed to address the fundamental dynamics of design and development under conditions of unsustainable energy resource practice. To address the energy issues there are today two kinds of building response. One focuses on regulation- or incentive-driven industry reform along passive energy design, conservation and efficiency lines, and the other seeks to drive more advanced forms of technological and design innovation which are needed to fundamentally transform the way built structures are made. Some countries, most notably among them Germany, pursue a mandated solar energy pricing policy aimed at jump-starting a new generation of buildings and architectural responses. In this vision, the zero-emissions house that functions without fossil energy supply, once the exclusive domain of eccentrics and university research laboratories, would become a living reality for a majority of dwellers. Yet to be addressed, however, remains the question of how to reduce the large amount of energy that is embodied in the building materials themselves, the services contributing to their making, and the energy implications of the very form and design of neighborhoods and cities. Indeed, the energy household of cities is made up by more than buildings and the infrastructures that service these. It is the sum total of all goods and services measurably consumed in a given location. Modern globalization, in the general sense of a complex set of global economic, communications and cultural changes, is very much driven by the profoundly fossil energy mode the world operates in. Global supply lines are required for securing oil, coal and natural gas from the limited number of highly productive fields in production: the mining, shipping and processing of the raw material and its world-wide distribution has necessitated a vast network of logistics, military management, security arrangements and diplomatic agendas — as well as specialized economic systems. A majority of current and recent regional and local armed conflicts are resource wars, in part or entirety. The specter of violent global strife over the control of regional and global fossil fuel supplies rises in the short and medium term (Scheer). The great 19th and 20th century industrialization and modernization drives accompanied the rise of a globally dominant fossil culture with its specific rules, values and powerful images structuring collective and individual desire. Their unique behavioral patterns are generated by the characteristics of supply and demand in a global fossil fuel fired economy. Seen in this light, the global media, information systems and telecommunications networks play a rather ancillary role in the processes of contemporary globalization: the fundamental technologies of globalization are the at once centralized and globally active power generation and petrochemical resource systems tethered to geographically limited and hence geo-strategically critical energy resource and mineral deposits. International trade rules and interpretations of national security are based on and very much support this global system. The result is a single terrestrial system, rapidly growing and fed by tenuous yet distant, even global supply lines. As a consequence, an increasing number of local urban areas is surrounded by formerly productive but now either suburbanized or relatively impoverished, disconnected rural and semi-rural regions. These new ‘globalization hinterlands’ are the former supply regions of pre-fossil villages and towns, now increasingly defunct, with their population streaming to the rising, brightly lit and comfortably powered, globally networked urban centers. The deployment of renewable energy technologies has a potential to help bring about a time of differentiated globalization, marked by a distinction between largely local supplies of food and elementary goods on the one hand and the global trade in services on the other. Postglobalism as engendered by non-fossil production modes is characterized by a rise of regional economies in support of urban centers, based on regional resources such as productive land for food, biomass and wind energy production. New ways of re-knitting central cities with their regional economies and related spatial structures are already being pursued by a number of communities. These are based on age-old principles of rural urban support economies, boosting the primary sectors of agriculture and forestry: cities around the world are beginning to make concrete links between their renewable energy needs and potential regional resources capable of meeting that need. This movement is also beginning to help spawn new indigenous manufacturing and advanced industry sectors in renewable energy production, supply and services. On the industrial side current initiatives fall into two categories; that of aiming at technology development on one side and technology use or market uptake on the other. Technology push and supply from the 1970’s through the 1990’s were limited to a number of limited-scale industry efforts and pockets of largely government-sponsored research and development projects. This history is marked by an absence of a significant market demand, or market-oriented policy push, given the overwhelming subsidies granted generally to the fossil energy sector. However, the international and domestic policy and pricing environment of the early 2000s is changing fast, heralding massive urban technological and practice changes and a natural integration of technology development and markets. Cities face the new challenges largely without national guidance and some seek to go beyond individual technology applications, single structures or limited urban areas. They hope to translate international and national agreements onto the local level, despite the institutional constraints of the inherited sectorially divided systems. Increasingly, urban leaders seek to grapple with the issue of technological innovation, absolute and globally equitable emissions targets, the prospect of urban carbon trading and the pursuit of full integration with mainstream urban management systems. The most hopeful visions describe entire cities as net renewable energy producers. This idea requires a rethinking of urban-regional alliances as well an adoption of increasingly firm industry promotion practices. The Australian city of Melbourne, as an example, is in the process of investing in renewable energy producers with the dual aim to reduce its fossil fuel dependency and to promote the development of more advanced industries that one day will be capable of competing nationally as well as internationally. As motivating force compensating action on subsidies and selective pricing, even in the absence of a true deregulation of energy markets, spells a boon for technological innovation. In a technologically advanced renewable economy energy supplies no longer exclusively depend on large, centralized supply models but can unfold in a more diverse and differentiated manner, in keeping with the contemporary culture of convergence. Indeed, emerging conditions are characterized by a certain blurring of conventional distinctions between production and consumption. Traditional appliance and facility users can become net energy generators, for instance through solar systems or zero-emission, renewable-source based hydrogen fuel cells in vehicles, capable of powering homes and external machinery. Systems convergence dynamics point to a merger of information technology, telecommunications and energy systems. While some electric utilities already lease their grids for information transmission purposes, emerging technology goes much further: future energy systems are ubiquitous and pervasive. Operating on the level of individual units, be they consumer appliances, households, neighborhoods or even city-regions, the long-range energy management paradigm is grid-free, self-sufficient and renewable. Ubiquitous energy management is introduced here as the notion that in a renewable-energy based economy a myriad of small and medium-scale providers of energy services replaces the system of large-scale centralized ones. This system can operate both at the high end described, but also at low levels of technological sophistication. High-end technology contains vectors from information technology and telecommunications mergers to the blending of these new technologies with energy production and consumption modes residing everywhere, from personal apparel and equipment to cars and facilities. At the lower end of the scale, distributed, low-cost and low-maintenance small hydro-power and solar systems are capable of leveraging access to global information network for small remote communities even in least developed nations. Another technological dimension of the impending energy revolution is the role the internet plays in the energy sustainability of cities. The 1994 United Nations Conference on Environment and Development held in Rio de Janeiro has firmly associated the term sustainability with a global action agenda, connoting international processes of working towards sustainability aims, especially in an urban context. The tradition of sister city arrangements was a rudimentary beginning of inter-urban networks in particular, while activist non-governmental organizations such as Greenpeace pioneered the working in global networks as means for local action. A number of international networks operate today in the area of energy and the sustainability cities, and all are in the process of exploring the best manner in which the nature of the internet and the world wide web can be exploited to productive ends. Some are listed in the reference section of this paper. It is instructive to remember that the internet itself, by now a vital global infrastructure, is highly dependent on fossil fuel and needs a strategic action plan to base it on renewable and sustainable energy sources, through the introduction of suitably distributed, even ubiquitous power supply systems. Local policy environments during the late 20th century were marked by a lack of commitment to planned urban energy practice, due to the investment in existing centralized power arrangements, a pervasive process management culture without clear accountabilities and the absence of local levers, incentives and practical means of allocating or influencing emissions. As global agreements get progressively firm under mounting pressures to resolve the greenhouse challenge, and as nations and trading units such as the European Union begin to establish firmer greenhouse, energy and environment frameworks, the pressure mounts to construct workable arrangements to approach urban emissions and energy practice with. In a world in which cities emerge as global emissions performers, distributed energy managers and ultimately as credit trading entities, a science and engineering practice emerges that interprets cities and city regions as power systems, resource flow units and point-of-emission entities. The most visible of current community planning models are based on relative improvement targets and selective means of accounting for greenhouse gas (GHG) emissions. A number of place-based emissions allocation techniques and action approaches are currently in use, ranging from the United States Environmental Protection Agency’s systems of support available to states in compiling GHG inventories, producing action plans and staging demonstration projects, to the pragmatically approximating system developed by Ralph Torrie and others for the Cities for Climate Protection™ (CCP) program operated by the International Council for Local Environmental Initiatives (ICLEI), which does not account for all emissions yet is in experimental use in four hundred communities world-wide, to the system based on the behavior of large geographical units — one degree of longitude by one degree of latitude — developed by the Association of American Geographers in a program called Global Change in Local Places (Kates et al). Other systems are in development and being promoted as well. There is the potential to apply aspects of the Advanced Local Energy Planning approach developed under the International Energy Agency’s (IEA) Building and Community Systems program, the physical model of the economy developed by the Australian Commonwealth Science, Industry and Research Organization, and another ambitious model, a total-flow, end-consumption and value-based accounting system (Lenzen) currently being advanced by an IEA initiative known as Solar City (see below), which also aims to compare, evaluate and advance a range of methods. While most GHG emission sources and mitigation efforts are inherently local, their effects and most easy modes of measurement are global. However, the identification of globally diffused GHG levels carries little practical meaning locally. In order for cities to become active and integral participants of any global action program, they need to opt for one or the other GHG accounting or allocation method that reliably links local practice to global aims. A persuasive argument holds that only systems directly applicable to reliably measuring contributions to climate stability are valid, and more specifically approaches that embrace the aforementioned 3.3 ton of carbon dioxide-equivalent target by 2050. An ideal method has not yet been arrived at, and in pursuing it, cities and their supporters need to apply certain performance criteria. To be informative, universally acceptable and suitable as a basis for coordinated climate stable practice, the model needs to be comprehensive, precise and accurate. To be action supportive it needs to be pragmatic, affordable and easily replicable across a large number of communities or geographic units. Another challenge lies in avoiding a new information poverty barrier: it could develop were any local carbon trading to be pursued based on highly sophisticated and expensive forms of data gathering — poorer nations have less capability to cope with the technical challenges involved in measuring current emissions performance, let alone reliably monitor its progress over time. The single most widely promoted method, that deployed by ICLEI’s CCP program, is to be introduced by local governments as the first of CCP’s five steps to better GHG performance: namely the arrival at an energy and emissions inventory, forecast, reduction target, target achievement plan and active implementation program to achieve measurable GHG reductions. At these relatively early days of the CCP program measurable success in reaching significant implementation goals has been elusive, while the other milestones have been reached to highly varying degrees. It is possible that in future rounds of development, in association with other methods and given a better understanding of the key barriers to success a break-through in implementation can be achieved. As it stands now, the very methodological imperfection of the method and its omission of significant emissions makes the CCP system attractive in practical terms but scientifically difficult to use in globally credible accounting contexts, or even for local improvement monitoring over time, in terms of total performance. Indeed, there are a number of obstacles to transformed urban energy practice, although none of them are insurmountable in principle. The most formidable is the fact that local governance structures are not usually geared to end-state or long-range planning, and hence the adoption of any form of long-term accountings. The effective allocation of incentives and accountabilities is difficult, too. Notwithstanding the efforts described above there is the persistent question of how to convincingly disentangle resource flows in a local government area not only for carbon accounting but also for scenario modeling purposes, and how to identify agency accountabilities for savings and reduction. The adoption of broad energy and greenhouse action programs opens up new dimensions for government. It begins to supply new development perspectives and drive regional realignments, the formation of state initiatives and industrial alliances. It can mean a new sense of empowerment and the opportunity for economic strengthening, as well as competitive advantages of a more promotional nature. Indeed, whatever the difficulties, the benefits are promising. Governments have begun to discover that energy responses can be scaled well to local development conditions and growth options. In newly industrializing countries with interest in maintaining considerable levels of autonomy such as China and India there is a good fit with local traditions and climatic and economic conditions. Local industries get stimulated while environmental agendas are being reinforced. Comprehensive renewable energy practice on the local level directly reinforces broad quality of life aims, as well as healthy water, food and bio-diversity practice. Besides meeting the aim of responsibility devolution and other local subsidiarity objectives in the search for meeting global greenhouse objectives, another government reform agenda item is being satisfied as well: the call for accountability in public service. Outcome-geared reform and strengthening of local governance in delivering on indexed and measurable performance is a natural byproduct of integrated sustainable energy practice. Local consensus, too, is expected to be forthcoming more easily as agendas become more clearly understood and visible in tangible improvements. The challenge for urban governance is unprecedented. In the absence of useful established patterns of practice, a search is under way for new models capable of unifying local government’s sectorial concerns, technology imperatives, energy markets as well as global agendas. As a good example of a current attempt to support cities’ quest for sustainable energy futures, Solar City represents a new generation of International Energy Agency (IEA) research and development work whereby solar energy techniques are being linked with other renewable energy technologies and means of greenhouse gas emissions reduction and absorption not only in a coherent spatial and social context, but also applied within a finite and community-wide time-line. This program is to work with a number of participating cities in nurturing a Solar City network, supporting local action by augmenting existing efforts. Since its beginning after the early 1970’s oil crisis the IEA has expanded its agenda from international energy security concerns to climate change, and recently moved from serving primarily OECD countries to reaching out to the rest of the world. In its Committee for Energy Research and Technology (CERT) research and development agenda there is a growing emphasis placed on renewable energy, and on expanding from a technology development mission to a community and market push. This program is being developed in co-operation with a number of other renewable energy international implementing agreements within the CERT agenda and is designed to operate in conjunction with related existing industry and community networks. The mission of this program is to advance an integrated set of renewable energy technologies in cities, with the aim of producing absolute emissions reductions of the extent and time frame required for stabilization of the atmosphere at the sustainable GHG concentration of 3.3 tons of GHG per person per year. The rationale of its aim at absolute and equal targets is based on a belief in equity-based emissions control which implies a reduction for industrialize countries, and scope for a growth supporting increase in many less developed nations. The IEA conducts well over one hundred research and development projects into a very wide range of relevant energy technologies and management techniques operating under such international 'Implementing Agreements' as Bioenergy, Geothermal, Hydrogen, Hydropower, Photovoltaic Power Supply Systems, Solar Heating and Cooling, Wind Energy, Buildings and Community Systems, Demand Side Management, Energy Technology Systems Analysis, District Heating and Cooling, Energy Storage, Heat Pumping, Heat Transfer and Exchangers, Hybrid and Electric Vehicles as well as a range of other related activities, programs and information centers. Within this extraordinary portfolio many activities offer direct solutions and systems that can be promoted and applied in cities, others have more indirect significance. Solar City operates as a globally coordinated, nationally independent and funded program involving largely OECD countries but also aiming at engaging non-member states such as China. The program banks on the fact that fresh approaches to urban planning are emerging world-wide, based on the realization that the days of relatively problem-free power generation methods as a platform for development are numbered. These fresh approaches challenge national and international institutions to revisit the established local, regional and national patterns of community planning. They also place new demands on multilateral and bilateral aid programs. For example, in China the performance criteria of designing such approaches are clear: it will have to be comprehensive, affordable and replicable. The China Integrated Town Infrastructure and Environment Strategy (CITIES) is currently being advanced by Solar City to help integrate solar and other renewable energy technologies in Chinese towns and cities, along with energy conservation and efficiency measures, with the dual aim of maintaining sustainable emission levels and lower reliance on fossil fuel. To face this historical challenge planners in a number of cities, towns and urban regions have begun to link renewable energy objectives to planning and community development aims. As a result, opportunities in infrastructure, built fabric, land use, urban form and regional development are being discovered while efforts to mitigate greenhouse-gas induced global warming have redoubled the resolve behind these initiatives. In this new world of development, China is well placed to become a global leader in innovative, sustainable forms of urban development, domestically and throughout the developing world. Many aspects of rural decline, unsustainable land use practices, desertification, reduced bio-diversity, water pollution, deforestation, urban and rural poverty and uncontrolled urbanization are either brought about or significantly contributed to by the conditions engendered by centralized, fossil-fuel or nuclear powered electricity production, its enormous costs and serious limitations. Chinese towns and cities that are being developed and built today under the fossil-fuel paradigm will be fundamentally outdated and become unmanageable within this generation, threatening a massive crisis in just a few decades from now, when the conditions underlying contemporary urbanization patterns will have dramatically altered. Many of China’s provincial and smaller town communities hope to take advantage of the opportunities brought about by this new set of circumstances. These not only spark local business and industrial innovational impulses but also deliver renewed higher productivity value to the regional rural economies surrounding the settlement centers. In China, this means that an integrated approach to whole-of-town planning can be embraced, one that rallies institutional, land-use, transport, facility and construction planning around the increasingly central issue of renewable energy management. The rural anchoring potential of this approach is particularly important in a country in which the overwhelming majority of inhabitants is still counted as rural. China ranks among of the world’s three leading energy consumers and producers, and is rapidly rising among the world’s top net petroleum importers. Its largely coal-fired economy consumes ten percent of the world’s primary energy supply, with an emissions rate to match. The challenge is both national and regional: the great diversity of China’s provincial and regional realities makes it necessary to work towards a nationally integrated energy policy with the help of locally meaningful and integrated town and rural development strategies. Therefore, to focus on China’s town development within the framework of national resource sustainability and self-sufficiency strategies makes good sense, to boost local and regional environmental benefits. In 1997, 32% of China’s population officially lived in urban areas; this figure is to rise to 45% by 2010. Actual figures become considerably higher when applying criteria that include the de-facto urban but statistically rural component of the population. Energy is significantly consumed in cities and towns, while the very form of energy supply adds a destructive side to growth, rendering it unsustainable both in the short and long term. Traditional electrification schemes based on outdated fossil fuel plants not only wreak damage in air pollution locally, regionally and nationally but also serve to detach rural areas from towns and other forms of urban agglomeration. This fossil-fuel induced segregation of town and rural context has its mirror in the separation of the sub-disciplines that make up modern town planning. Both are among the root causes of unsustainable development and hamper the relevance and effectiveness of many international aid programs. Sewerage, water supply, power, transport, land use planning, building regulations and agricultural planning are generally managed in isolation from one another, frequently yielding slow and even contradictory outcomes. By contrast, traditional forms of town development depend on the very linkage between these elements and an extremely high efficiency rate. It is telling that modern sustainable approaches to urban management begin to re-establish these in some way. In this new approach waste disposal through recycling and other regional resource flow dynamics begin to inform and enrich the local economy. Local energy strategies and urban management in general are not merely related but actually identical, due to energy’s fundamental role in the viability of local economies and ecologies alike. By not duplicating but enhancing existing and related national and local urban development programs and networks Solar City builds on a growing momentum world-wide, adding valuable intelligence, focus and an unequivocal implementation mission nationally and locally. In seeking coordination it interfaces well with international development aid and loan programs. The program is capable of working as a primary partner in multi-lateral settings of development support, but it also lends itself well to the construction of inter-city and town-regional support networks, with or without affiliation with international NGO or local government networks. World-wide, prospective cities and national partners are positioning themselves in Korea, Japan, Africa, Australia, North America and throughout Europe, at all levels of development and in different size categories and development stages. The participant areas range from entire city regions to individual new town settlement programs. Solar City aims at working collaboratively in all locally relevant institutional contexts. It focuses on the energy supply and technology side, but embedded in a total town planning and design strategy that also includes institutional arrangements. It promotes a community-wide, rural and urban energy and emissions accounting system as well as performance targets that are linked to urban development and reform initiatives. Finally, it advocates land use strategies that are based on a consideration of urban-rural linkages and value land use and transport investment choices according to their potential contribution to long-range energy and resource self-sufficiency. Solar City strategies. This activity is to identify local planning and development approaches that are conducive to the introduction of solar and other renewable energy technologies, within a broadly energy-conscious community development approach. To be addressed are issues of strategy, planning tools, organizational arrangements, legislation and standards, incentive structures, public information and exemplary municipal practice. By introducing improved ways of adopting solar and other renewable energy technologies the program is to contribute to climate-stable practice in the building and property development industry, land-use planning and infrastructure development. Solar City is also to strengthen local governments’ efforts to build enlightened community performance and household preferences. community action development, industry alliances, information and education. This activity is to investigate each of these in detail and develop advanced means of building improved urban practice approaches, in full partnership with the participating cities. Targets, baseline studies and development scenarios. The objective of this activity is to introduce, evaluate and enhance suitable approaches that help understand the role of solar and other renewable energy technologies in the broader urban energy context. Means deployed will include absolute climate-stable carbon dioxide-equivalent emissions targets aiming at 2050, introduced in ways that support their quantification and translation into implementation paths along shorter-term milestones. To do so it is important to build a baseline model of the performance of each Solar City in terms of a range of key indicators such as greenhouse gas emissions, renewable and non-renewable energy use, household consumption patterns and transport mode distribution. A general town catchment is to be defined for emissions accounting; the existing energy and emissions situation is to be recorded and assessed; basic global indicators (CO2-e) are to be established; and urban indicators such as annual emissions output per capita to be introduced to study the behavior of nominal resident, working and visiting populations. Planning methods based on energy and emissions accounting methods may deploy backcasting approaches. This involves the development of alternative urban development growth trajectories, maintaining sustainable CO2-eemissions and fossil fuel use rate goals for 2050, then ‘backcasting’ growth milestones for emissions in order to determine workable reduction rates for each milestone period. Scenarios of anticipated emissions reduction rates are important for the determination of alternative sustainable development paths. Suitable scenario approaches are to be developed, for example by using a physical model of the regional economy and vary these to agree with milestones. Urban renewable energy technology, systems and industry development. The objective of this activity is to work with cities in advancing renewable energy technologies and systems, and to help promote the renewable energy industry, in a way that can serve as model for the rest of the national urban system. The emphasis is therefore on research and development work into market-led approaches of technology system development and deployment, though pricing, investment, electricity purchasing policies, information, model action and other means. Optional paths are to be developed, evaluated and implemented, suitable for the informed and broad introduction of solar and other appropriate renewable energy technologies as part of a comprehensive portfolio, for the use of city governments, municipal utilities, businesses, industries and households. Special emphasis will be on micro-generation and distributed low-energy production in buildings, facilities and urban systems. Current, emerging and potentially competing solar and other renewable energy technologies, systems and related urban services are to be assessed for their urban modification and city-wide, systematic introduction in ways that are meaningful to cities’ development agendas — physical planning, sustainability objectives, organization, services — and their pursuit of targeted emissions reductions. Results will include a comprehensive and dynamic portfolio of technology, systems and industry development options, suitable for selective and targeted implementation in general and specific action plans. The focus will be on what city governments in collaboration with industry and constituent urban communities can do to advance the direct use of renewable fuels for industry and transport; the generation of electricity in quantity, such as solar power stations, wind, biomass, geothermal and hydro; and, primarily, on the development and deployment of technology development strategies in industrial and residential consumer-oriented application, such as stand-alone power generators, heat pumps, photovoltaics, solar hot water and solar cooling. General investigation program in best practice. The objective of this activity is make accessible and apply useful lessons from current and recent related initiatives domestically and world-wide. This objective will be achieved by studying successful practice in integrated urban energy planning, management and projects. The activities include an identification of scope and criteria for evaluation; information gathering and documentation; study and evaluation; analysis and description; case study development; and communication and dissemination. The scope will encompass technologies, management practices as well as growth strategies. As a point of departure, at least three categories of case studies will be differentiated: comparable cities, urban precincts and settlement projects but also development policies and programs. General investigation program in learning from action. The objective of this activity is to monitor, analyze and feed back program experience derived from the participating cities. This will help develop a shared understanding of the barriers to, dynamics and impacts of community, institutional, industrial and technological change, with a view towards the planned and targeted, GHG-reductions geared phasing in of solar and other renewable energy sources on an urban and regional scale. This activity will not only be useful to the participants, but of value in the application of lessons and methods across the national urban system. Because of the very impacts of fossil fuel we live in a rapidly urbanizing world, and cities and city regions are central and fertile settings for effective energy policy, programs and projects. Cities are not only powerful markets for the introduction of renewable energy technologies but also the national and regional seats of political power, and the core settings of cultural discourse and technological innovation. They form the very frameworks for development: local government, planning structures and the powerful civic organizations that are so important in many cultural contexts. Cities face extraordinary opportunities in the gradual but inexorable change from the risky and costly systems of fossil power reticulation to a world of sustainable, affordable, diverse and ultimately ubiquitous energy management. The hope is one of growing choice in scales of operation and levels of technological sophistication. Fundamental changes in urban power regimes that are in keeping with sustainable development practices promise to revitalize regional and rural development, and boost urban business and technological innovation. And by pursuing energy reform strategies in keeping with globally sustainable greenhouse gas emission levels, local urban leaders can also act globally by helping achieve greater equity and justice in international development. Byrne J., Y. D. Wang, H. Lee and J. D. Kim. (1998). An equity- and sustainability-based policy response to global climate change. Energy Policy 26 (4), 335-343. Girardet, H. (1999). Creating Sustainable Cities. Schumacher Briefings 2. Devon: Green Books. Howard, E. (1902). Garden Cities of Tomorrow. London: Swan Sonnenschein. Kates, R. W., Michael W. Mayfield, Ralph D. Torrie and Brian Witcher. (1998). Methods for Estimating Greenhouse Gases from Local Places. Local Environment, Vol. 3, No. 3. Carfax. Lenzen, M. (1997). Energy and Greenhouse Gas Costs of Living for Australia during 1993/4. Energy Vol. 23. No. 6. pp 487-586. Pergamon. Newman, P.W.G. and Jeffrey R. Kenworthy Newman. (1987). Gasoline consumption and cities: a comparison of U.S. cities with a global survey and some implications. Murdoch, W.A. : Murdoch University. Scheer, H. (1999). Solare Weltwirtschaft. Kunstmann. Wahlefeld, G. (1999). Zeit und Maß der Kohle. Feuer und Flamme. Sonne, Mond und Sterne — Kultur und Natur der Energie. Bottrop; Essen: Pomp. ISBN 3-89355-194-8. Over the past two centuries fossil fuels have facilitated an exponential increase in the human capacity to act on the environment and on its own destiny. Fossilism is here defined as this unique and brief development period in society, economic systems, cultural meaning, urban form and architectural expression. It can be expected to last no longer than roughly three centuries (1750-2050), as a brief era driven and marked by an all-encompassing, global dependence on fossil fuels. The time leading up to Fossilism was that of an entirely different world, albeit characterised by a strong continuity in underlying forces. While fossil fuels have not fundamentally altered the patterns and inclinations of societal dynamics they certainly have amplified and distorted these enormously. It is useful to study the characteristics of development preceding the fossil age to understand the nature of change that is intrinsic to a fossil-fuel dependent culture. This may help to contemplate the opportunities that lie in the inexorably nearing post-fossil period. Even before the full-blown arrival of a coal, oil and gas dependent global culture, a series of technological and cultural innovations began to signal the nearing industrialised era. Protofossilism saw a preparing of the ground, an intensely technical and scientific, Cartesian drive for innovation, fuelling a desperate search for new sources of energy to satiate the burning yearning for liberation with an all-consuming faith in the new. This time is marked by the great engineering works that were inspired by and followed the French and American Revolutions, visible in the works of Ledoux, Boulé and other revolutionary architects, and in the urban innovations of Haussman and l’Enfant. Before fossil manufacturing techniques and design styles fully bloomed in the 20th century, they experienced an early arrival in the form of industrial structures and building innovations, largely made possible by the power of coal, mechanisation of production, the coal fired steam engine and the motor car, science fiction, the telegraph, photography and cinema. The 20th Century before Second World War was an extraordinarily frenzied period of fossil dreaming, a veritable Zeitgeist conflagration of petroleum-powered technology, discoveries and inventions. Modern mechanised war machinery, mass production, telephony and broadcast radio, the motor car and air travel, industrialised building technology, the advance of the skyscraper and modern mega-engineering feats, often associated with the massive supply of power. Futurism, Constructivism, De Stijl and other brands of early Modernism explored the possibilities associated with the new-found powers. The Garden City movement and early suburbanisation settled the very frontier that had been opened by fossil fuel facilitated technology. The quarter of a century following the Second World War was marked by an explosion of petrochemical innovations such as polymer technology, fertiliser and pesticides and a colourful new world of consumer products and lifestyle supports. While in the built environment the impact of the International Style swept through the big inner cities of the industrialised and developing world alike, suburban life forms mushroomed with the extraordinary success of the motorcar, a massive urban infrastructure roll-out and new, cheaper building materials. Intermittent fossil fuel crises and the rising realisation of impending global ecological catastrophes spawned prototypic explorations of ‘solar’ and zero-emission homes, and other means of reducing the environmental cost of progress. These, however, remained embryonic, sporadic and marginal – and indeed symbolic at best. The real property booms of the 1980s saw an explosion of architectural exuberance, a reveling in the flood of inner-urban investment drives, particularly in the commercial building sector. Known in Japan as the 1980s ‘bubble’ period, skylines were remade globally in a building frenzy ultimately leading to a world-wide real property crash. The majority of buildings hastily erected during this lemming-like period of property development was even more wasteful in energy terms than their predecessors. The very fossil exuberance of neo-modernism and so-called post-modernism was the weapon of choice in the battle for the bigger, better, brighter comparative advantage. Energy consumption equated progress, once again. Today, Fossilism is on a declining trajectory, although it is still unclear at best what precisely will replace it. Despite a wide-spread acknowledgment of the dire need to dramatically shift direction the current, late-fossilist period is marked by three parallel manifestations of the very contradictions that mark our confused and confusing period. Fossil Revival is visible in the current Dutch-derived nostalgia for de- or neo-constructivist and neo-1950s, so-called retro-styles in architecture. Neo-fossilism or, better, Fossil Revival is a collective means of denial, endearing stage-set fakery designed to deliver delusions by blurring a brutally obvious reality. Occasionally Fossil Revival is being played out with such sarcastic honesty, in such open and sophisticated denial of the energy and environmental imperatives of this time that it better be understood as and termed Critical Fossilism. This feature of Late Fossilism lampoons the excesses of Fossilism in a half-consciously self-deprecating and mocking, even shocking manner. SITE, OMA, Jean Nouvel, Daniel Libeskind and Lebbeus Woods have occasionally embarked on brilliant if unaware acts of critical fossilist commentary by design while Frank Gehry’s latest titanium excesses are clearly features of Fossil Revivalism, golden fireworks launched off the Titanic’s bridge. Pseudo-Postfossilism is a feature of the post-fossilist age. Its products superficially and symbolically adorn mainstream fossil facilities with energy saving and production devices, from photovoltaics and solar hot-water panels to energy-rating configurations of façades and building elements, while not fundamentally altering their performance or configuration. Postfossilism Broad outcomes of a new practice cannot realistically be expected until the fundamentals of development and design have been transformed, and full lifecycle costing, long-life modularity, low energy embodiment, renewable and sustainable self-sufficient surplus production of energy in every facility and indeterminate flexibility have become hallmarks of common practice. The prototypes are with us, such as in the exemplary work of Malaysian architect Ken Yeang and an increasing number of practitioners, developers and institutions world-wide. The ideas have, however, not yet entered city and regional planning and urban development practice.